A threatening Valentine’s day tweet posted by the Home Office six years ago has resurfaced on Twitter, where hundreds of people have branded it ‘disgraceful’ and ‘cruel’ and expressed disbelief that someone once thought it was acceptable. The tweet, sent when Theresa May was in charge of the department, warns people who enter into so-called ‘sham marriages’ – marriages organised only to allow a non-British spouse to qualify for a UK visa – that the Home Office will catch them. 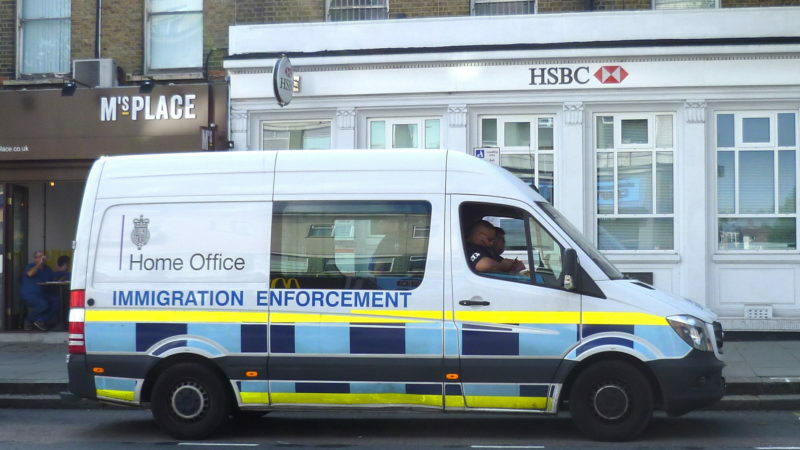 Although the tweet was originally posted in 2013 – the same year May piloted and promptly scrapped ‘Go Home’ vans, which drove around London threatening undocumented migrants with arrest if they didn’t leave – it has attracted over a thousand comments since being rediscovered. Many people have pointed out that although the department would probably be too scared of backlash to post such a starkly brutal message today, its attitude and policies have not changed – aside from maybe getting worse. People may feel they have no choice but to get married in order to stay in the country because the system has become so harsh, commenters said, citing the fact immigration rules have become stricter and stricter, charter flights are still routinely being used to deport people on mass, and asylum seekers, who could face death if deported, are being denied fair hearings. Other people responded by pointing out the hypocrisy of the department, offering examples of both its incompetence and unjust rules. Since 2012, there’s been a minimum income rule on spousal visas, which means only people earning a certain amount can bring their partner to the UK. This suggests the right to family life is only for rich people, and undermines the idea that the Home Office cares if a marriage is motivated by love. In addition to having presumably hired a better comms team, one reason the Home Office might not post such an explicitly threatening tweet today is the enormous amount of scrutiny it is already facing for its unjust and unethical actions. Last week, on the same day 15 people were sentenced for obstructing a deportation flight, the first charter plane left for the Caribbean since the Windrush scandal, taking more than 30 people to Jamaica against their will. This week, it emerged that the Home Office has been working with the Zimbabwean government to accelerate the deportation of asylum seekers despite high-profile human rights abuses in the country. The Home Office might have become slightly more wary about what it says in public, but it certainly hasn’t got any better.